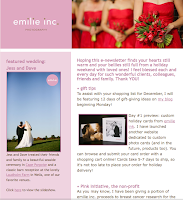 The holiday e-newsletter was delivered last night and has been getting a great response! If you missed it, be sure to sign up for the next issue (by adding your email address in the column on the left). Starting Monday, look for 12 days of inspiration for photo gift giving ideas this holiday season! Back in July, filmmaker Sharyn Paul Brusie and her husband Kevin interviewed several of my clients for the video testimonials that appear on my website. Sometimes it is not possible to meet clients before they book with me if they are planning from afar. So, to give those prospective clients a glimpse at who I am, we also made a short film that includes footage of the studio, me on the job, and a personal interview. It is now on the website under the information tab, labeled "the experience." And boy, what an experience it was! Once those lights went on and the camera was rolling I completely clammed up! Really! I can typically talk to anyone with ease about my business and how much I love what I do. But for some reason, I was soooo uncomfortable! I felt almost naked. I wanted to crawl under my chair! Cry! Walk away! But I didn't. I hung in there and tried not to overthink the questions Sharyn was asking of me. She did an amazing job editing those parts of our interview where I don't look nervous- tho she did manage to squeeze in a few that I'm quite mortified of. Sharyn says what I'd call "dorkiness" comes across as "endearing." Uh-huh. You be the judge. To further explain my level of nervousness, I said that I flew on Air Force One. Everyone who knows me knows that I flew on Air Force Two when I was working at USA Today! How did Air Force One come out of my mouth anyway? I had no idea I said it until reviewing the final film. So, there should be a little * on that part of the film with a link to this graph in my blog post. Very strange. Last February I photographed the boys of Troop 007 from Lewiston as they learned the sport of curling at the Belfast Curling Club for Boys' Life Magazine. J, an Eagle scout, came along as well and also took some video to capture the steps of how to play (the video is not up yet, but will be here soon). Not only was the slippery ice a challenge for photographing, but the below-freezing temperature made operating our cameras incredibly difficult. Nearly a year later, the story is in the magazine's December issue and the memory of that painfully cold day is forgotten. What a fun layout! After a delayed start (our shuttle bus Portland to Boston broke down and we missed our flight, thus also missing our connecting flight in Charlotte. We had to spend 24 hours in Charlotte which was rather frustrating but ok because we were lucky to have dinner with bride and friend, Carolyn), we are safely back home after a whirlwind trip to St. John. In 36 hours, we were lucky to explore most of this 9 mile island in a fun Jeep, sample some of the local fare with three caterer visits and at Flavors (a rotary fundraiser that featured about 20 restaurants), and (drum roll!) see our wedding villa, Kalorama!! It's absolutely stunning and exactly what we envisioned! We'll be staying there for the week of our wedding with friends, and hope to have our wedding dinner reception there as well. We have a better grasp on some other decisions that still need to be made (rehearsal dinner location, ceremony beach, etc) and will update our wedding website as they come together. We can't wait for April! Below are a few snapshots, and check out my Facebook page for more. I hope you all had a great weekend, too, and are gearing up for the food coma to come on Thursday! I'm looking forward to spending the day with my family here in Maine and wish you all a special day with loved ones, too! For the next four days, this is where we'll be! After a busy wedding season without a true break since May, J and I are sneaking away on Thursday for a quick trip to St. John for our wedding planning! We'll be busy with appointments visiting caterers, choosing our beach ceremony location and generally finding our way around our chosen destination wedding location. Kenny Chesney is rumored to be on the island for the month, so perhaps we'll do a little celebrity spotting as well. We're leaving our laptops behind, so I'll return all phone calls and emails from the studio on Monday. I'll also be sending out my holiday newsletter next week. If you haven't already signed up to receive it, be sure to add your email by clicking the link in the left column. Have a great weekend! If you have been following my updates on Twitter (that little update box in the left column) or my status on Facebook, you know that this is Week 3 of WWL (my self-named Wedding Weight Loss program)! With just five months until our wedding and the somewhat less-busy days of the off-season, getting in shape for our beach wedding has recently gotten bumped up my priority list! Like many others, my weight tends to creep up and down depending on life events. Stress, sadness, busy schedules and major change = gain. Less stress, happiness, relaxed schedules and even activity pattern = loss. It drives me nutty, but I'm working hard to maintain a bit more balance. The short-term goal: Get back into a regular exercise routine, lose 5-7 lbs before starting wedding dress shopping at the end of December. The long-term (April 25, 2009) goal: Have more overall energy, lose 10-15 lbs total. I've resumed my twice weekly workouts with my personal trainers, Cindy and Dan, at Body of Work in South Portland, after two months off. I started working out there three years ago and the trainers have become good friends, and a place I look forward to visiting (it's the sore bit the following day that isn't so much fun!). I tried Zumba during Week 1, hoping that might be the missing cardio piece I dread (there's nothing worse than that gerbil-on-a-wheel feeling on the elliptical at our house or treadmill at the gym). Zumba is a very smart distraction from the usual workout. With fun Caribbean music and dance routines designed to make you "shake it," it's calorie burning in disguise. Brilliant. Altho fun, it wasn't exactly a hard enough workout for my taste. It felt like I was on a cruise to Mexico without the margaritas. I shared this with the instructor to which she replied, funny enough, that the class goes to Margarita's on Thursdays after class! If I dedicate an hour to exercise a day, I'd rather feel flattened at the end. Next, I tested out a 90-minute "hot" vinyasa yoga class at Portland Power Yoga. Holy cow! I had heard stories of this practice, but nothing could have prepared me for such an intense workout in 95-degree heat inches apart from 50 other people! I went with my best friend Kara and met client-turned-dear friend Kelsie, and we set up in the back row (there are no mirrors and the instructor roams so we were on our own to watch those around us to pick up the poses). There were moments I thought I was going to pass out and moments where I was amazed and proud at us and other moments where I was regretting the red wine we drank the night before (and I know Kara and those around us were regretting the garlic Kara had in her dinner! Tee-hee) as it dripped from our pores. I've never sweat like that in my life! I took a peek in the mirror after class and I looked as tho I had just stepped out of the shower! What a wild experience. I went back in Week 2, and hope to keep up with it. It's different and challenging, and easy to see quick results. Excellent. My excitement for hot yoga may need to be put on hold for a bit- 6 weeks to be exact- because a major change is about to happen tomorrow. I am starting boot camp! Yes, me! At 5:30a! I am a) not a morning person and b) not a cold weather person (ironic, I know, as I live in Maine). So this should be interesting. My designer Christina has been going and really enjoys it so I (thankfully) won't be alone. I'm eager to try something (insanely?!) different to jump-start my weight loss so I've signed up to go three days a week, ending just before Christmas. I'm absolutely terrified, to be honest. Watch Twitter to see how it goes! Wish me luck! I did not meet Jess and Dave until a few weeks before their wedding, but had enjoyed frequent emails back-and-forth during the planning phase. Within moments of their visit to the studio for the first time, they felt like old friends (and good ones, too, when they mentioned their rehearsal dinner was at The Ramp- the bar, not the restaurant- in Cape Porpoise, a favorite of ours too!). Their wedding was a glorious fall day at one of our favorite venues. Be sure to watch the slideshow below (or click here to have it open in a separate window)! I met Jess at Eddy-Taylor Salon with her mom and friends. What a sweet, fun little shop! This was a first! Jess' dress was hanging in the attic at her parents' house! After a thorough trip to Sephora, Jess was ready to tackle her own wedding day make-up. Love this! Jess' feet coming down the stairs, and her dad waiting for his first glance! Jess' brother rode his Schwinn to the ceremony. Jess and her father hiding in the back of the church. Love the buoy decor! When I asked Jess the ideal image she hoped I would capture from her wedding day, it was one of her in full head-back laugh. Check! Some of the best sunsets I have photographed are from Laudholm. The warm, glowy light is perfect for portraits. Some brides clasp family brooches or their "something blue" to their bouquet. Not Jess! She has a little election reminder! Another sumptuously yummy cake by Gayle at Let Them Eat Cake! Darkness falls. Dinner was under the tent. Dancing was in the barn. Congratulations, Jess and Dave! What a great wedding! We left with such happy hearts (and full bellies!). Thank you for welcoming us with such open arms and open minds! I know you weren't excited about the portrait part of the day, but yours are some of my favorites from the season! We hope to see you both sometime for a pint at The Ramp real soon! Port City Life Magazine puts out an Arts Guide each year. Seeing as my studio is in Portland's Art District and participates in art events such as the First Friday Art Walks and is a member of the Society for East End Arts, I definitely wanted to participate in this annual guide. If you see this little book around town, be sure to pick one up. They're free! Each listing includes a brief paragraph about the business and pertinent contact info. I also purchased a half page ad, excited to support the vibrant arts community in town. I laughed out loud when I saw my studio featured in an editorial piece about the trend of second floor studios above busy storefronts (mine is above the North Star Café). Described as a studio that stages wedding shots and features images of Gore and Bush from the 2000 campaign trail, neither of those statements is true (I don't pose my work and my editorial work is on my website, not in the studio). When I inquired, they said an intern who helped with the article obviously didn't check their facts. Oops! We had the pleasure of meeting Liz and Sean at Kate and Jonathan's wedding last year in Kennebunkport. When they got engaged soon after, Liz chose her wedding date based on our availability! An overcast day on the Long Island Sound in Connecticut. This is Liz, all smiles on the morning of her wedding. Thankfully there was a pipe in her room at the inn high enough to hang Liz' beautiful cathedral veil. Meet handsome Sean. J is loving the 85mm for groom's headshots lately. The gals wait for their limo to arrive. I was lucky to ride with Liz and her dad in a sweet Bentley! They were married in Liz' father's church. Liz calms her nerves just before heading down the aisle (by J). She was all smiles by the time she met Sean at the altar. This is one of my absolute favorites of the day. Such a sweet pause in the usual harried receiving line. Portraits on the grounds of the inn. The ballroom was gorgeously decorated with black & white linens, and splashes of hot pink. Very fun! The reaction (I love mirror body language). Such a tender moment at the end of Liz' dance with her father. And the fabulous Kate and Jonathan, who have become such good friends! It was a blast to spend time with them! Congratulations, Liz and Sean! We were so touched that you asked us to come capture your celebrations in Connecticut and wish you both enormous happiness in your life together. Hugs!